Since the release of "Jaws" almost 40 years ago, sharks have had to deal with more than their fair share of public image problems. But the archetypical shark is no mindless, man-hunting predator. "Personality traits have never been determined in sharks before," David Jacoby, a shark expert at Institute of Zoology in London, U.K., and a recent author of the report, says to The Dodo. "We were keen to understand the mechanisms behind their social behavior." Catsharks are a bottom-dwelling species, fond of spending the day dog-piled atop one another on the floor of the Atlantic Ocean and Mediterranean Sea, before venturing out to hunt at night. But who joins the catshark cluster depends on their personality type, Jacoby and his colleagues discovered through observations of 100 captive juvenile sharks. Monitoring the fish in groups of 10, the biologists found that certain sharks showed gregarious inclinations, and were much more likely to rest in a "conspicuous" heap. Yet other sharks preferred solitude, frequently camouflaging their skin to blend in with the habitat bottom, the scientists write in the journal Behavioral Ecology and Sociobiology. In an email to the Dodo, Culum Brown, a fish behavior expert at Macquarie University in Sydney, Australia, who was not involved with this research, writes: "To check for personality you must show that these measures are repeatable. That [they are] stable over time." And this study, he says, checks that box. 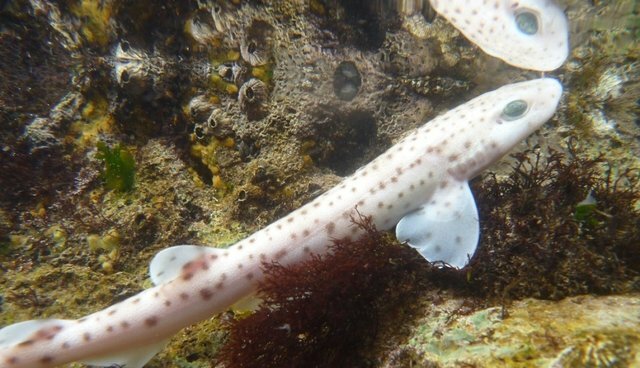 It's not that some sharks were excluded from the group, says Jacoby - young catsharks don't display dominance the way wolves do, for example - but rather that certain sharks made a choice to hide out on their own. And the fish who piled up did so because they preferred the company of specific sharks. Olfaction (that is, sniffing out a friend) or some other sense could be leading the sharks to each other, as opposed to a desire to just join any group, the biologist notes. "There has been a seismic shift" in the way animal behavior experts assess personality, Brown says. "I submitted my first fish personality paper about 10 years ago and it took two years to convince the editor that animals could have personality," he says. "Now we come to the realisation that each animal is an individual with its own idiosyncrasies." The study is the first step toward fleshing out what it means for sharks to have personalities. Jacoby would like to see the results replicated in the wild, which he says could now be done thanks to technological advances like tracking satellites. But one thing's for certain: "Fish are more intelligent than they appear," he says. It's fair to draw certain parallels between the behavior of humans and catsharks, he points out, as the two are both social animals in constant interaction. So whether you're at home curled up in a chair, book in hand, or in the heart of a crowded dance floor, take heart: you're just going along with your inner (social) fish. This post has been updated to include comments from biologist Culum Brown.